Violas and pansies are irresistible with their cheeky little flowery faces. I enjoy looking at their different colour patterns and trying to work out possible parents. I love what my designer bees do to pansies! These plants have big hearts. They appear in the toughest places and can flower at all times of the year. Some of my favourite pansies in the garden are either blue, or yellow, or combinations of these colours. I conscientiously collect and label seed each summer. My colour descriptions are quaintly precise - for example, how could I forget the 'light blue top yellow bottom maroon blotches' ones? I've bought packets of well known seed varieties. My favourite used to be a variety called 'Romeo and Juliet', which were like the colours of old ball dresses - muted rose pinks and rich creams. I don't think this variety is now available. 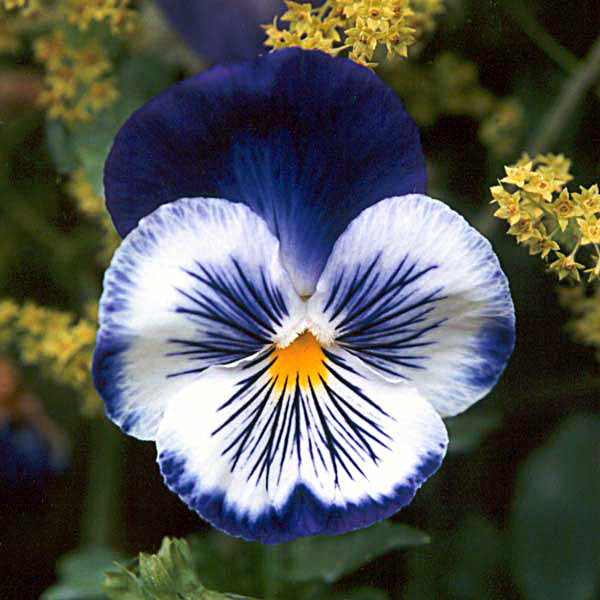 Most of the blue and lemon varieties of viola were started from seeds ordered from my favourite catalogue. I've also bought seeds of the variety called Jolly Joker blue. Occasionally I'm allowed to cheat with trays of readymade seedlings from the nursery. Why not?